Daughter is moving next week to the Inland Empire region of Southern California. She will have a rental car for the first week, but Dad needs to score a sweet ride for her by the time the rental goes back. 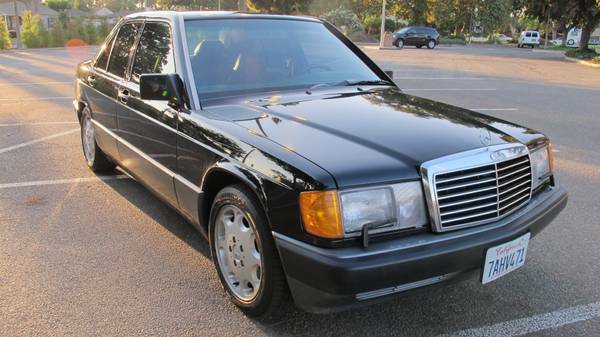 The criteria are pretty straightforward: something modern but nothing newer or bigger than a W124 (I'm thinking 107, 123 or 124), good service history with all updates, all systems fully functional, decent looking in and out (she prefers red exterior) and of course able to pass all required California emissions tests. This needs to be the kind of car in which you wouldn't hesitate to send your own daughter out into the desert by herself; I will be requiring a full pre-purchase inspection from a qualified shop, since I won't be able to inspect it myself. I've budgeted $4k but would prefer to spend less. Please PM me directly with a full description and your asking price. ...... I've had the responsibility of providing cars for each. I see a red flag in your posting, and it's the MB criteria. I was happy to seek out and maintain MBs for the girls as long as the cars were close enough to home I could repair them if required. Once they left town, MB was off the table. The potential cost/reliability issues killed the Benz option for me. You and I may be into the cars, but I'll guarantee you your daughters are not. They may claim so, but don't believe it. For my youngest, I went a different direction. Ended up with a Toyota Solara. Whilst not the good deal the Century was, it has 5 plus years of boring reliability, with only tires, battery, oil changes, required. It's amazed me over the years what my girls have done with (or to) cars, and both aforementioned cars stood up to the abuse (and wrecks in the Buick). With the Buicks I developed a saying about GM products: 'Nothing runs poorly longer than a GM car.'. These are all antique cars. . .not something that you can walk into a random auto parts and walk out with anything you need. And, who is going to fix it? She needs something that is going to run more or less most of the time. Buy something domestic so anyone can work on it. She does not get to choose color over getting a good car. 4K isn't much so spend those dollars on a "good" basic dull car not "more" of a car ( options and such ). Whatever is purchased, give it a heavy preventative maintenance like all coolant hoses, electric fuel pump , filters , belts , crankshaft sensor , plugs / wires , battery if it is more than 3 years old , brake pads if sub 40% thickness remaining and anything else that is getting towards end of expected life. This way the chances of the car being in the shop _yet again_ at random times is minimized. The worst mistake she could make is running out and leasing / buying a new car then being upside down with debt the rest of her life. Ain't gonna happen. Only way she could run one of those cars in your price range is if she's as handy with a wrench as Bodhi. I second the thought of an old Century. I've been thinking of trying to get one of them myself. Only thing that would possibly cause me to hesitate is an unfortunate experience I had with a 2000 Buick rental's air conditioner, and the question of the fire catching v6. But they are about the most rock bottom solid transportation out there having often been owned by older folks not prone to abusing them. 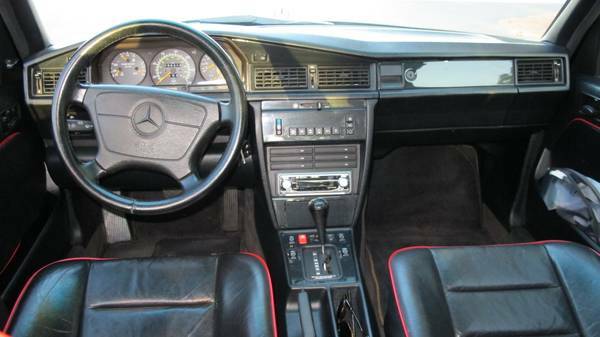 I just don't see one of your preferred Benz's being achievable for that price even if in great condition given their age. lease her a new toyota/hyundai/nissan/honda for $200/mo. 35-40 mpg, full warranty, roadside assist included. if you're dead-set on getting the perfect, cheap old merc for her this would buy you a couple years to search out the perfect car. Thank you all for your comments. As you might have noticed from my signature line, I am no stranger to vintage Mercedes-Benzes and I know exactly what I am getting into here. To those of you who hijacked the thread by recommending all sorts of other conveyances, thanks, but no thanks. I wasn't asking for recommendations, I was asking for someone who was selling a car that fit my parameters to let me know about it. My daughter just took ownership of a '93 190E Sportline LE, a solid ten-footer with 100% fully functioning accessories and only 168k miles, for $3,200; the W201 with the M103 is just about as bulletproof as a mechanical device can get, and they tolerate neglect exceedingly well: I regularly flog my '84 190E with M102 motor (which everyone knows is just two-thirds of an M103) all day long, both on and off the race track, with nothing other than regular maintenance every once in a while, and it has never ever let me down. Never. Ever. And I anticipate nothing less with this new addition to the family. Oh, and I forgot to mention the stack of receipts and original window sticker that came with it. nobody hijacked your thread; helpful, prudent advice was offered by a bunch of folks who are also not strangers to vintage mercedes cars. glad you found a good car for your daughter. Looks like you scored a miracle there. Well done. Hope it works out for her. Thank you all for your comments. As you might have noticed from my signature line, I am no stranger to vintage Mercedes-Benzes and I know exactly what I am getting into here. While it isn't in _my_ sig line, I have 40 + years in and around the auto repair business. When I had my shop I looked at many used cars for customers and recommended certain ones based on their needs and budget. I'm not a brand snob, I'll drive anything that runs and I've driven a few things that don't. My car selection is based on what is easily repaired and cost effective to purchase. The point is that while you are familiar with older MB, the car in question will be out of your reach for even the simplest repair. Other threads have lamented that many independent MB shops won't touch cars older than 2000 or so. Unless you find a reliable shop than is willing to look after the car, she is taking a huge risk. At minimum she has extended loss of transport during a breakdown and at max the car is write off. To those of you who hijacked the thread by recommending all sorts of other conveyances, thanks, but no thanks. I wasn't asking for recommendations, I was asking for someone who was selling a car that fit my parameters to let me know about it. My recommendations were based on her actual needs and if someone else in a similar situation looked at this thread. Proceed at your own peril. Unless the trans has been rebuilt, it is getting close to losing reverse and / or chewing off the governor gear. If this still has CIS, expect the fuel distributor to fail / fuel pumps ( 2 ) to fail if they haven't been changed. Be sure to keep this thread updated as to how the car is holding up and if a reliable repair ship is found. Sure it is possible that the car is in run forever condition and a good shop could be found but, in her situation being out in the wilderness so to speak, the risk is too great. When your daughter needs a repair shop, I suggest she goes to Jim's German Auto in Corona. I will be requiring a full pre-purchase inspection from a qualified shop, since I won't be able to inspect it myself. How about a Toyota with a Mercedes emblem taped onto it. Or a six cylinder Subaru-- The 4 cylinders have head gasket issues. Hate to say it, but unless your daughter knows how to do the incidentals and pick up on car problems before they become a full failure an old Mercedes is not the way to go. I would not send my daughter into the desert in an old Mercedes. Your daughter will get screwed every time she goes to get that thing repaired. About the only thing I might trust would be a well maintained diesel 123, 190, or 124 before the 1990s when they started putting in lots of eletronics. But, you are taking a chance on old belts, plumbing, atrophy brake lines etc.. you name it. As far as having a shop inspect the car.... I bought a car off ebay from florida. I had a forum member who owned a shop nearby inspect the car. Yeah he inspected the car, but failed to mention a **** ton of stuff that I would have noticed in person. Had I inspected it in person I would have walked at the price I paid. So don't think an inspection is gonna pick up everything. You play nice and so will I. 96 E300D, 71 Baja Beetle, 77 Convertible Beetle, 2003 Subaru Forester. Given it has been a year and in the name of science, how is this car holding up? Thanks for following up; she loves the car and I have first dibs on it when she outgrows it. Other than the cracked oil pan from taking speed bumps too fast and the AC being barely adequate in the face of 100+ degree weather (neither of which we can blame on the car), the only major issue has been a head gasket replacement, which we knew was coming when we bought it. I can't recall how we found him, but care and feeding is being provided by Kevin at Inland Mercedes Service in Riverside, and we couldn't be happier with either his technical abilities or his bedside manner.